Picture it, a warm sunny Sunday afternoon in the Castro. You’re hungry, but of course the Castro doesn’t have anything worth eating unless your into overcooked or uncooked fast food. Walking down Market Street you see glistening in the sun, bottles upon bottles of tequila. You stop and stare across the street wondering where this tequila heaven came from and why you didn’t know about it. This little scenario is a real life account of how I stumbled upon Hecho at the corner of Market and Sanchez. It was of course Sunday, which everyone knows now a days is considered brunch, which usually means heavy on the eggs, and while there are plenty of egg’ish dishes on the menu at Hecho, they also give eggless folks plenty of options. I ordered one of my all time favorite meals, a chile rellenos. My dining partner ordered the griddled corn cakes with chipotle butter and agave syrup. I was in doggy heaven. The chile relleno was paws down the best chile relleno I’ve ever had. 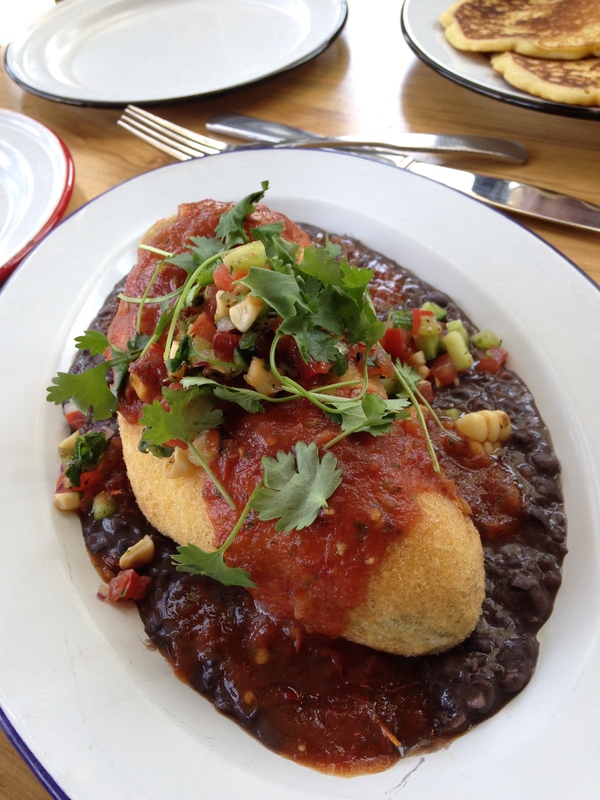 Sitting on a plate of warm semi-refried black beans was the enormous fried poblano pepper, stuffed with cheese and topped with fresh salsa and cilantro sprouts. It was perfectly fried, without the slightest hint of grease. It was perfection on a plate. The griddled corn cakes were warm, and blistered in all the right spots adding to the smoky goodness of the corn meal. The chipotle butter was spicy and sweet and add to that the rich sweetness of the agave syrup. Oh, and let’s not forget the amazing assortment of house-made tequila drinks and the breathtaking selection of tequilas. If you are a tequila lover, this is the place to be. It was so good while I was sitting at the table I made reservations for dinner. But for this little doggy, who is not a fan of the brunch scene, this place is a must.